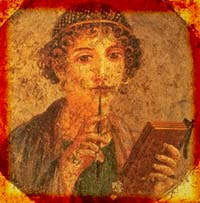 The educational system of the Pompeians was not very different from that of Rome, being the city Roman until the 80 B.C.. In Pompeii, predominantly commercial city, had to be spread the level of education, knowing the people how to read, to write and to make accounts. In pre-Roman epoch, the children were entrusted to the mothers that infused them the principles of the social and the moral relationships. ​Evolving times, since the end of the Republic, the greatest part of the Pompeians entrusted the child to a teacher, usually Greek, or sent him to school (ludus litterarius).